A few weeks ago we spoke about one of our clients, National Grid, winning big at the ENERGY STAR Awards. This week we want to take the opportunity to talk about another one of our clients and the awesome success they've been experiencing. Mass Save is an initiative sponsored by Massachusetts’ natural gas and electric utilities and energy efficiency service providers. And KSV has had the honor of being the shepherds of the Mass Save brand, partnering with the sponsors to be sure that Massachusetts residents and business owners understand that energy efficiency can save them money and make them more comfortable. 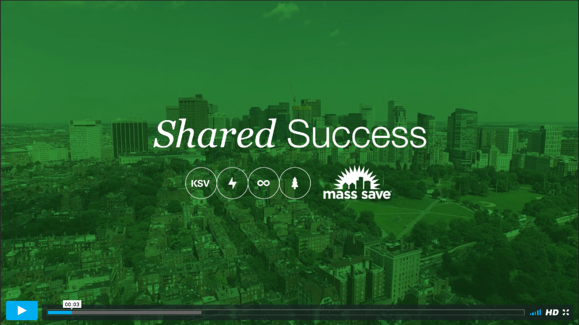 Mass Save does a lot of things well (and Massachusetts benefits from Mass Save's efforts, ranking #1 in the ACEEE state rankings for 6 years running), and among the things that they do quite well is measuring the efficacy of their marketing efforts. From tracking brand awareness and familiarity to market penetration, Mass Save has years of historical data on their performance, and this years performance is better than ever. So we made this little video just for them (and you!). We’re proud to be partners with a brand like you. And we’re excited to see what’s next.